A squirrel finds God’s provision on our deck beneath our backyard oak tree . With the settling in of fall my wife and I both like to spend the weekend mornings out on our deck. Many branches of our old oak tree loom over the deck giving it a quiet woodsy feel. The cool temperatures and a warm cup of coffee make it the perfect spot to read, journal, pray and enjoy God’s creation in our own backyard. But sometimes a hard hat is required! Several squirrels feast on the bounty of acorns that bloom in the branches above our heads. 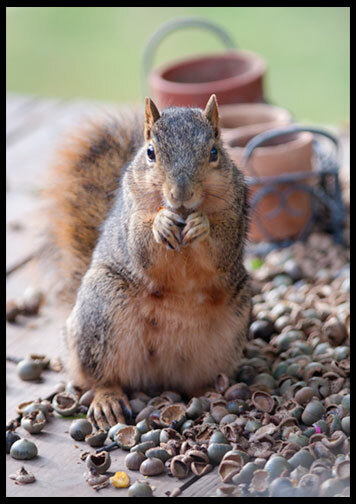 They release dozens of acorns to the deck below as they scarf them down. 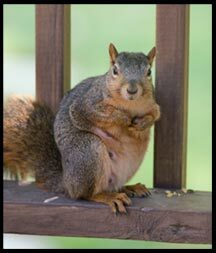 Not only do the acorns litter the deck, they occasionally crash on top of the head of someone relaxing below. Despite the cranial hazards it is still a beautiful place to spend a Saturday morning. While I glance at the commotion above I catch glimpses of the perpetrators hidden among the leaves. I also catch the feeling of exuberance. Their considerable joy overflows from the oak onto the deck as the squirrels dine on what to them must be an extremely tasty breakfast. They are not just eating; their cup overflows with God’s abundance to them as He fattens them up for winter. 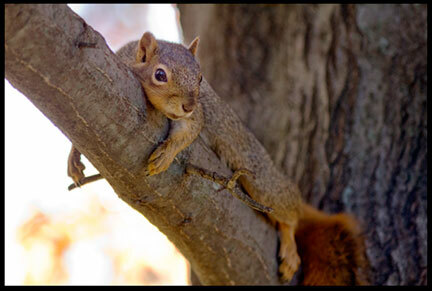 A squirrel takes A siesta in our Oak after feasting on God’s abundance. Secular science would have us believe that an oak tree produces millions of acorns in its lifetime to reproduce itself and perhaps two or three other oak trees that were not as successful in reproducing. Do we really believe this? No. The reason an oak tree produces so many acorns is to feed God’s creatures such as the squirrels, deer, blue jays and other animals that find nourishment from the nut of the oak. In our oak tree overhead, we hear the joyful sounds of God’s abundance and provision. Creation not only reveals God as provider, but also reveals God as a God of pleasure and abundance. 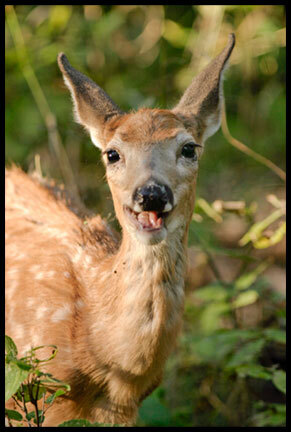 Although this fawn looks as though he is smiling at the camera, he is actually chomping on an acorn as God provides for him. Jesus said, “The thief comes only to steal and kill and destroy; I came that they may have life, and have it abundantly. (John 10:10)” God’s abundance in our lives doesn’t necessarily come from material things, as many are prone to think. God’s abundance comes in many forms. 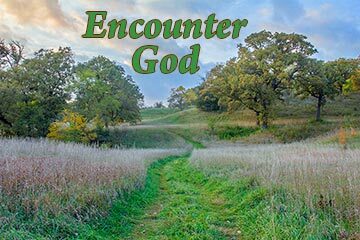 It comes in the form of friends, family, joy, ministering to others, life experiences and the depth of a our relationship with Him and our salvation in Him. Life is greatly enriched when we experience His abundance in these things. I wrote more about what a bounty of acorns can tell us about God in another blog post earlier this year. I enjoyed your squirrel pics and the article. All your post are good. It’s hard to pick a favorite. This blog was wonderful about the acorns and the Lord providing food for them. Thanks Barbara! God is good. Enjoyed today’s pictures and truth you shared! Beautiful way to start my day.Thanks. You are such a good writer of God’s word and his messages. I can feel the Holy Spirit in the text. Thank you for sharing. Thanks Morris. When I sit down to choose the photo and verse and think about what to write the first thing I do is pray.